I absolutely love my Fitbit. I’ve worn the Ultra, the One, the Charge and the Charge HR, and now I’ve upgraded to the Fitbit Blaze. Each time I’ve upgraded, it’s been for new features offered. I’ve never been upset with a device, in fact I still have all of them and have flipped between them as needed, and overall I’ve seen the same performance among the devices in terms of calorie burn, step count, etc. As I’ve stated multiple times, I’ve done my BMR and heart rate calculations on pen and paper and the Fitbit has always reflected what I expect to see. The Fitbit also agreed with the bodybugg that I wore prior to switching, so I’m going to confidently say that the device is accurate. I’m blown away by the new features offered from the Blaze and I’m going to break them down for you so you can “try before you buy” – I know $199.95 is a hefty price tag for a fitness device, but I full believe that is well worth your money. I see it as an investment in my health – I’m going to wear it all day every day and I check it about a million times a day. That equals out to a mere $0.55 a day investment, and that’s only if I wear it for one year. I know battery life is very important for people, myself included. I received my Blaze on a Thursday and charged it 100%. The following Monday evening, I received the low battery alert. Since then, I’ve charged it three different times, and on average the battery seems to last about five days, as Fitbit advertises. I’m completely fine with this – it’s actually longer than my Charge HR was holding (it averaged about three to four days). The charge time isn’t that long, either – that’s one of my favorite things about Fitbit devices, they charge pretty quickly so you can move on with your day. I tend to charge mine when I’m sitting at the computer working, or I’ll plug it in before I hop in the shower, so I have very little downtime. I also like that the battery life can be viewed in the upper left of all screens (except the home screen) on the Blaze, and also in the mobile app as with previous devices. 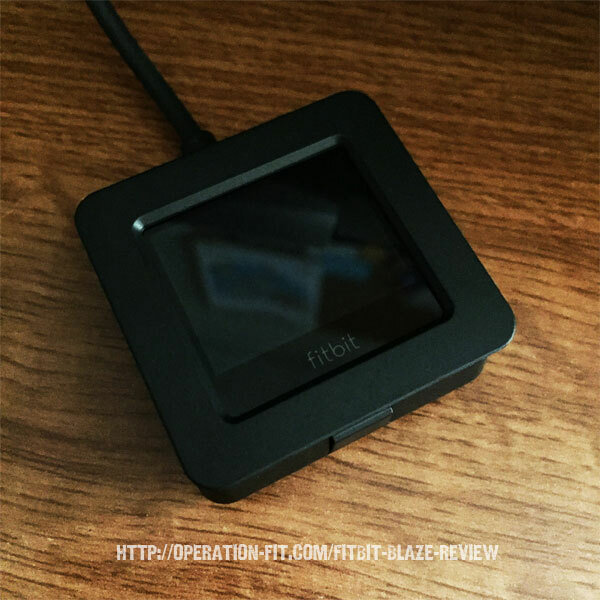 The Blaze charges completely different from previous Fitbit devices I’ve used. You actually pop the face off of the band and pop it into the charging device (connected to your computer via USB). Super easy. A main reason why I really like the Blaze is the different bands that you can purchase and swap out. My past devices were all very “sporty” looking, which I’m fine with, but when I’m dressing up I will flip over to my One so I can discreetly wear it on my bra. No more! The Blaze comes with three different type of band designs: Metal Links and Frame (stainless steel), Leather Band and Frame (available in black, camel and mist grey) and Classic (available in black, blue and plum). Now that I know I’m really happy with the device, I will be purchasing a Leather Band & Frame so that I can swap when a dressier look is needed (I purchased my Blaze with the Classic black for everyday wear). I am pretty much in love with the look of the interface on the Blaze. It’s attractive and extremely easy to use. You can choose from four different default clock faces, and those allow you to at-a-glance see your current step count, heart rate, and calorie burn from the main screen. My Blaze is currently set to “Pop” and I really like it. All of the main pages show the time and are interactive, allowing you to click through and see three basic stats: current heart rate, steps and calories burned. 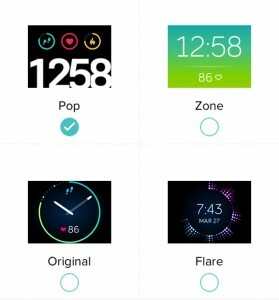 The Fitbit Blaze has six main pages with options. Today. This screen displays all of your current information for today’s activity. It shows you your current steps, floors, heart rate (along with your resting), miles, and calories burned. Exercise. I absolutely love this new feature! Through the phone app and website, you are able to select your seven most used exercises (and order them as you wish – most used to last) and monitor your burn during your workout. For example, mine are: Weights, Workout (cardio), Treadmill, Walk, Hike, Run, Bike. With the last four options, Fitbit tracks your distance and provides it with your Session Review (see review), along with your average speed. You are able to do the same on previous with the activity button (which I gave step-by-step instructions on how to do in this tutorial), but I love this new feature because of the addition of…the Pause button! Previously you had to stop your current log and then restart later, then add your time and calories together. Not anymore! Now you can pause your workout and resume it when you come back to it (which came at a great time for me with my new daughter – fussing babies don’t wait for workouts to be finished). During each workout, you can cycle through your calories burned, current heart rate, and the clock (which displays the actual time). The workout duration is constantly counting at the bottom of the screen. When you’re completed with your workout, you hit the Finish button and your Session Review for your workout are displayed (duration of workout, average heart rate, max heart rate, calories burned). This feature alone makes this device super valuable for me. FitStar. This great new feature provides on-the-go workouts right on your wrist. You have three options when you choose to work with FitStar: Warm It Up, 7 Minute Workout, and 10 Minute Abs. Each option gives you a move and gives you about a 10 second illustration of how to do it. Then it times you as you do it and counts down so you can see how much time is left. Each time a move is up, the Blaze vibrates so you don’t have to be staring at the display, you can concentrate on the move you’re doing. Just like the Exercise function, you receive a Session Review that gives you all of your stats (duration of workout, average heart rate, max heart rate, calories burned). 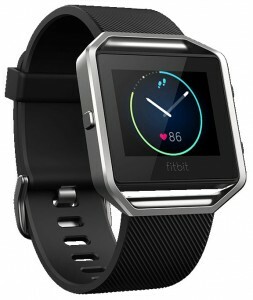 Fitbit also offers a FitStar Personal Trainer for an annual fee ($39.99 at the time of this review) that provides mobile customized training sessions on your phone, tablet or computer. At this time I have not subscribed but I will and provide and thorough review after I’ve played with it. Make sure you are subscribed to my mailing list if you would like to be notified when I’ve posted it (top right of my site). Timer. This is another great new function that I’m totally in love with – prior to this being available on my wrist, I had to use apps on my phone. You can choose from Stopwatch and Countdown, both are exactly what they sound like. They are super easy to use and convenient because they’re right on your wrist. I’ve used these for multiple things throughout the day, from workout function to timing cooking during dinner (over having the stove beep when my daughter is sleeping). My only complaint about this function is that you cannot access it during the Exercise function; for example, if I want to countdown for planks, I still need to use my phone app during my workout. Alarms. This has always been a function on the Fitbit, and it’s one that I use often. I have a daily alarm setup for my birth control pill, and it’s nice to set as a backup “wake up” alarm in the morning, too. Gentle vibrations, a “Look alive!” alert, and a quiet buzzing noise get your attention discreetly and remind you to take care of whatever it is you need to. Settings. 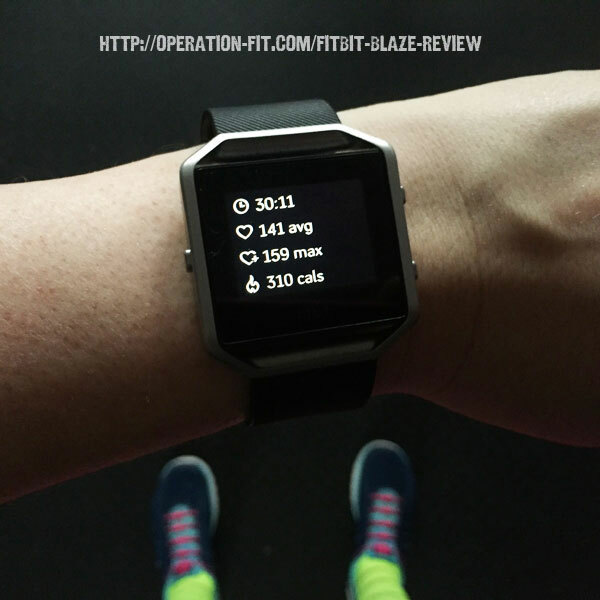 This page allows you to customize your Blaze (on top of the customizations provided on the Fitbit site and mobile app). You can turn on Quick View, which wakes your screen when you raise your write (love this! ), adjust the Brightness, turn the Heart Rate Monitor on and off, provides your device Regulatory Info (model number, etc. ), displays your software Version Number, and has as Shutdown button in the event you need to reset your device (I had to do it once when it wasn’t communicating with my phone). I filmed a little video to walk you through all of these functions in realtime so you can see how the Blaze works. You can also allow the Blaze to alert you when your phone receives new texts, calls, and additions to your calendar. I turned the calendar function off because I don’t really care about that, I know what I put on there, but I have found the texts and calls to be very helpful. In the past when I needed to see who was trying to contact me during a workout, that included walking over to my phone (and pausing my video if I was doing one). Now I can quickly glance at my watch and see if it’s worth stopping – if not, I can cancel the call (awesome!) and deal with the notification later. The only functionality I’m hoping they add in the future is Facebook messaging because I use that as much as texting. 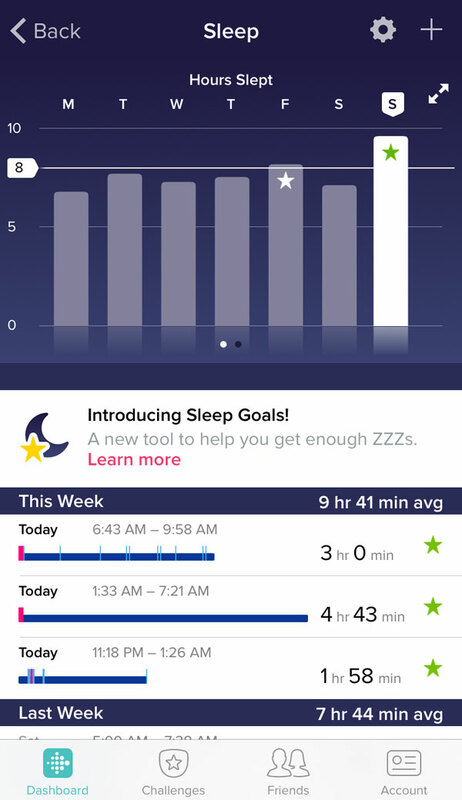 As with all Fitbit devices, the Blaze has the sleep tracking function set up and tracking automatically. It’s a great function to have and pretty darn accurate. I personally don’t track my sleep, I’m pretty aware of when I’m up or restless, but it’s nice to be able to look back and see anything I may want to reference. As with all of the other Fitbit devices, the Blaze syncs seamlessly with your favorite food tracking app (my favorite is My Fitness Pal). It connects to your phone and computer via Bluetooth – no more dongle taking up a USB slot! I was surprised when there wasn’t one in the box and had to look that up to make sure it wasn’t missing. The only syncing issue I’ve had is the Blaze and my phone losing connection at some points. I worked through Fitbit’s troubleshooting tips and turning my phone off and back 0n has fixed the issue every time – super easy! Yes, yes, yes! I am really impressed with the Blaze and have had no issues with it yet (I’ve been wearing it for a little over two weeks). I highly recommend purchasing directly through Fitbit (using the banner below) because their customer service is top notch. I’ve had other models fail in the past and they sent me new ones, no questions asked. If you purchase from a third party, you have to go through their warranty process first before going to Fitbit – in my opinion, totally not worth the hassle. If you enjoyed my review and will be purchasing the Fitbit Blaze (or another device), I would ask that you click on the banner below to purchase so I get credit. It gets me a little compensation for my time so I can continue to write free reviews like this for you. Disclaimer: I was not compensated for this review by Fitbit. I am writing this review candidly because I very much enjoy this product and wish to share my experience.